The Lifetime risk of cervical cancer article can now be found on the Cervical cancer risk page. Cervical cancer incidence rates (European age-standardised (AS) rates ) are significantly higher than the UK average in Scotland, and similar to the UK average in all other UK constituent countries. For cervical cancer, like most cancer types, differences between countries largely reflect risk factor prevalence in years past. Data is for UK, 2015, ICD-10 C53. 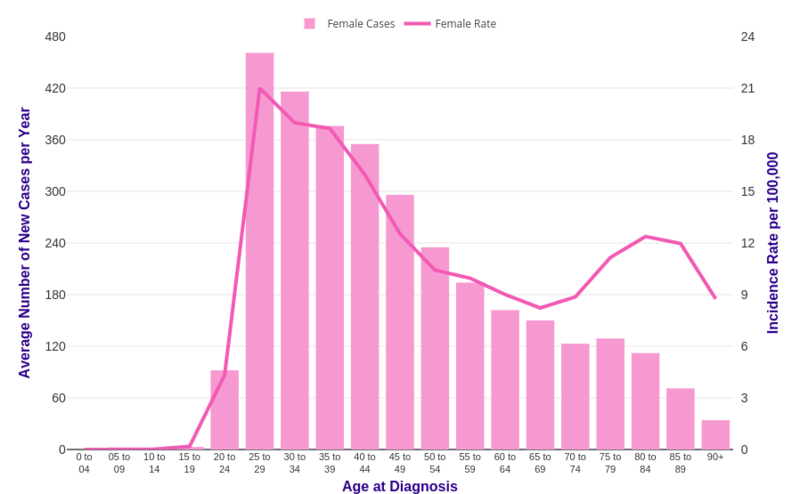 Cervical cancer incidence is related to age, with the highest incidence rates being in the 25 to 29 age group. In the UK in 2013-2015, on average each year around a tenth (11%) of new cases were in females aged 75 and over. 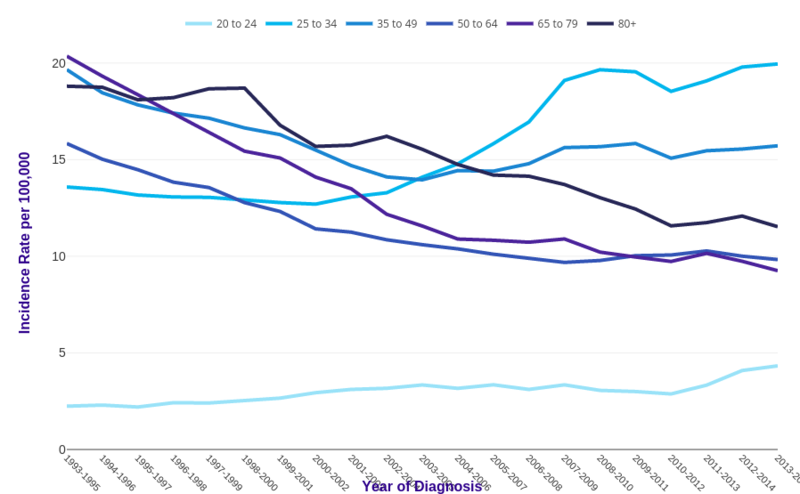 [1-4] This is a lower proportion of cases in older age groups compared with most cancers. Age-specific incidence rates rise sharply from around age 15-19 and peak in the 25-29 age group, then drop gradually until age 60-64 before rising again. The highest rates are in the 25 to 29 age group. For cervical cancer, like other cancer types with a screening programme, incidence increases rapidly at the age screening starts, as prevalent cases are identified. Incidence then tends to return to the usual pattern of gradual increase with age, which largely reflects cell DNA damage accumulating over time. Damage can result from biological processes or from exposure to risk factors. A drop or plateau in incidence in the oldest age groups often indicates reduced diagnostic activity perhaps due to general ill health. Data is for UK, 2013-2015, ICD-10 C53. Cervical cancer European age-standardised (AS) incidence rates for females decreased by 24% in the UK between 1993-1995 and 2013-2015.[1-4]. 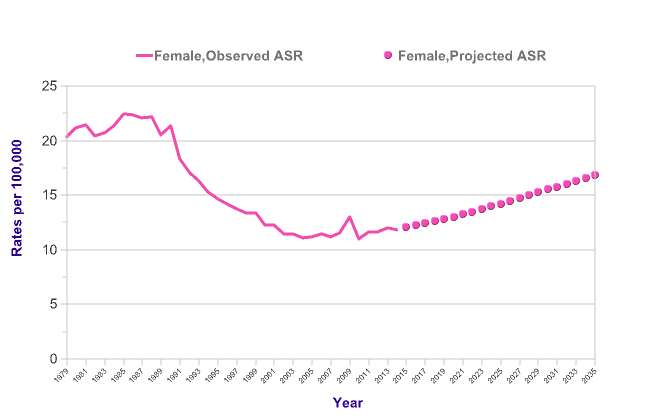 Cervical cancer incidence rates have decreased overall in some broad age groups in females in the UK since the early 1990s but have increased in others. [1-4] Rates in 20-24s have increased by 93%, in 25-34s have increased by 47%, in 35-49s have decreased by 20%, in 50-64s have decreased by 38%, in 65-79s have decreased by 55%, and in 80+s have decreased by 39%. 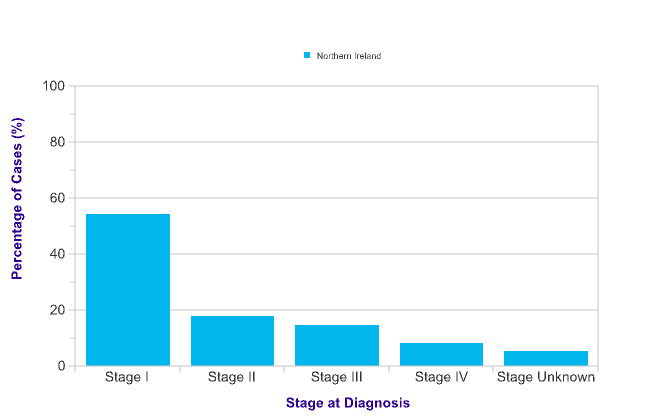 A high proportion (95%) of cervical cancers recorded with a known stage at diagnosis in Northern Ireland. Cervical cancer patients diagnosed with a known stage are most commonly diagnosed at stage I (57%). More patients with a known stage are diagnosed at an early stage (76% are diagnosed at stage I or II), than a late stage (25% are diagnosed at stage III or IV). Around 1 in 10 (9%) have metastases at diagnosis (stage IV). It has been estimated that around two thirds of cervical cancers are squamous cell carcinoma (SCC) and around 15% are adenocarcinoma (with nearly all of the remainder of cases being registered as poorly specified). [1-3] An analysis of cervical cancer incidence in Sweden has shown that an early age peak at 35-39 years is apparent for both SCC and adenocarcinoma. Vizcaino AP, Moreno V, Bosch FX, et al. International Trends in Incidence of Cervical Cancer: II Squamous-cell Carcinoma. Int J Cancer 2000;86(3):429-435. Vizcaino AP, Moreno V, Bosch FX. International trends in the incidence of Cervical Cancer: Adenocarcinoma and Adenosquamous cell Carcinomas. International Journal of Cancer 1998;75(4):536-545. Quinn M, Babb P, Brock A, et al. 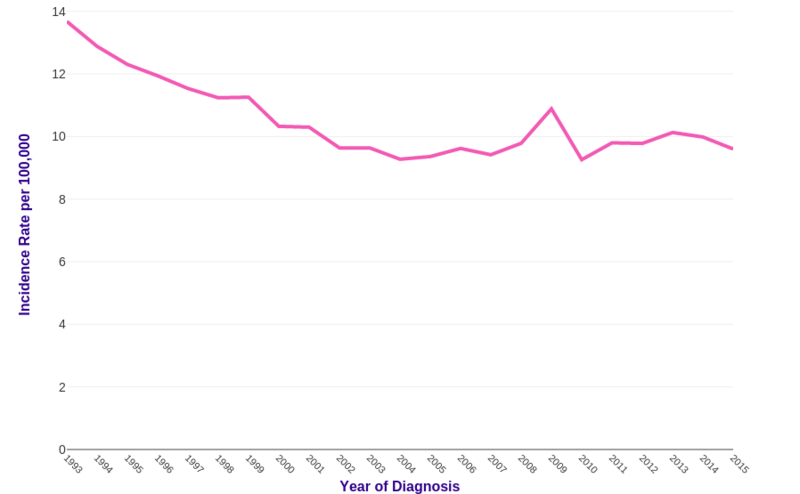 Cancer Trends in England & Wales 1950-1999. London: Office for National Statistics; 2001. Hemminki K, Li X, Mutanen P. Age-incidence relationships and time trends in cervical cancer in Sweden. European Journal of Epidemiology 2001;17(4):323-8. Ferlay J, Shin HR, Bray F, et al. GLOBOCAN 2008 v1.2, Cancer Incidence and Mortality Worldwide: IARC CancerBase No.10 [Internet]. Lyon, France: International Agency for Research on Cancer, 2010. Available from http://globocan.iarc.fr. International Agency for Research on Cancer (IARC). World Cancer Report 2008. Lyon: IARC; 2008. Cervical cancer incidence rates are projected to rise by 43% in the UK between 2014 and 2035, to 17 cases per 100,000 females by 2035. Increases in incidence has been noted for cancers associated with the human papilloma virus (HPV), including cervical cancer. However, the benefits of the HPV vaccination programme have not yet been realised. The vaccination programme was introduced throughout UK in 2008, offering the vaccine to 12–13-year-old girls. Therefore these projections could act as a benchmark to evaluate the efficacy of the vaccine, as its impact is not yet reflected in the data. It is projected that 4,792 cases of cervical cancer will be diagnosed in the UK in 2035. There is evidence for an association between cervical cancer incidence and deprivation in England. European age-standardised incidence rates are 72% higher for females living in the most deprived areas in England compared with the least deprived, as shown for females diagnosed with cervical cancer during 2006-2010. 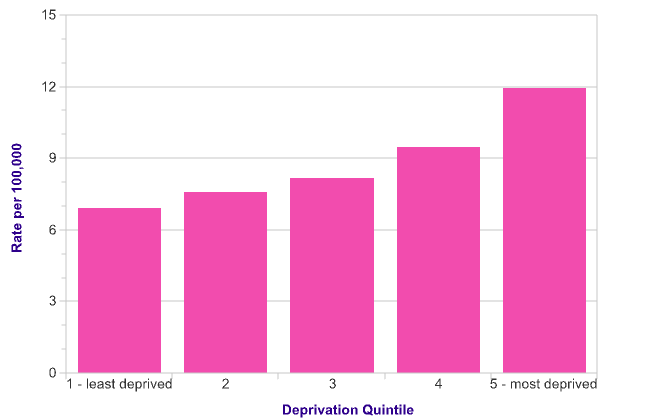 The estimated deprivation gradient in cervical cancer incidence between females living in the most and least deprived areas in England has not changed in the period 1996-2010. It is estimated that there would have been around 520 fewer cervical cancer cases each year in England during 2006-2010 if all females experienced the same incidence rates as the least deprived. Age-standardised rates for White females with cervical cancer range from 8.2 to 8.7 per 100,000. Rates for Black females are similar, ranging from 6.3 to 11.2 per 100,000, whereas the rates for Asian females are significantly lower, ranging from 3.6 to 6.5 per 100,000. Ranges are given because of the analysis methodology used to account for missing and unknown data. For cervical cancer, 11,579 cases were identified; 22% had no known ethnicity. An estimated 34,800 women who had been diagnosed with cervical cancer between 1991 and 2010 were alive in the UK at the end of 2010.